Doing things together is a great way for anyone to build relationships through shared experiences, challenges, trouble shooting, and having a great time. Below you will find a growing list of projects that we have run across that we think are cool enough to be worth providing below. 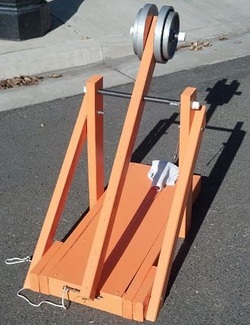 We built 4 of these for use in a competition at the Father/Son Team Day and we thought they would be perfect for dads and sons to build together at home. They are pretty simple to build and you can usually rummage up most of the parts from stuff lying around your house or the neighborhood. It only took us a couple hours to build. Here's the website off of which we based our trebuchets. We modified it so that by removing the bolts on the top of the supporting arms the whole structure would fold down for easy storage. You can see from the slide show of pictures a little bit of how I built ours. If you have any questions you can but if you have any questions you can seriously just contact me for help!